A map from the study “Mapping Neighborhood Transformation” shows the 7 census tracts that constitute the Codman Square neighborhood. Even as residents from Dorchester to Readville celebrate the arrival of the first-ever weekend service on the enhanced Fairmount Line, a coalition of neighborhood groups is planning to launch a grassroots campaign aimed at pre-empting the large-scale displacement of longtime residents who live near the commuter rail corridor – a fear fueled by a new study that shows that Codman Square could see dramatic demographic changes in the immediate coming years. A public forum has been scheduled for this coming Sunday afternoon at a Codman Square church in hopes of attracting impacted residents, who, organizers say, are already feeling the squeeze of rising rents and property values as real estate speculators seek affordable homes near now-viable public transit hubs along the Fairmount corridor. The forum will begin at 4:30 p.m. at Global Ministries Christian Church, 670 Washington St. Sponsors of the forum include the Fairmount/Indigo Line CDC Collaborative, City Life/Vida Urbana, The Union of Minority Neighborhoods, and Dudley Street Neighborhood Initiative. Gail Latimore, the executive director of the Codman Square Neighborhood Development Corporation (NDC), is one of the organizers. The NDC, which currently manages 900 units of affordable units in and around Codman Square, has re-developed and sold another 300 units of housing over the last two decades. Using a range of indicators – including the concentration of people over 75 years of age, the percentage of renter households and vacant lots, and the proximity to transit stations – the study maps out areas “most susceptible to transformation” to the point of singling out four streets – Stanton Street, Thetford Avenue, Rosseter Street, and Bowdoin Avenue – that analysts consider likely targets for displacement. A section of the report documents that certain census tracts have already seen significant changes to demographics in recent years and the study concludes that “Codman Square is on the cusp of neighborhood transformation,” advising Codman Square NDC to “aggressively and thoughtfully engage residents”– especially senior citizens – to stabilize the community and allow for “equitable” access to housing and other positive benefits of improvements to the neighborhood. 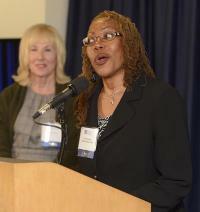 Gail Latimore: Executive director of Codman Square NDC. Photo courtesy Boston FoundationSince the study’s completion over the summer, Latimore said that she and other activists along the Washington Street corridor are hearing more frequent accounts from tenants who are facing steep monthly rent increases. In addition, homeowners have reported encounters with real estate brokers who are seeking to buy properties from longtime residents, many of whom are elderly. Mela Bush, an organizer with the Greater Four Corners Action Coalition, said she received notice from her landlord in September that her rent would be rising to $1,600 per month, a spike of $500 a month. Bush, who lives on a side street off Blue Hill Avenue close to the new Four Corners station on the Fairmount Line, says she was able to negotiate the price hike down by $200. Still, she will now struggle to feed her four-person household in the neighborhood of her birth and worries that many of her peers could be pushed completely out in the coming months and years. “The people on my street have been living there for 40 or 50 years and many of them are starting to age out of the homes. We’re concerned that some of them will be tricked into buying reverse mortgages and then be unable to hand these homes down to the next generation,” said Bush, who noted that homeowners in and around Four Corners have been solicited in recent weeks by real estate speculators offering to buy their homes for cash at below-market prices. “One of our board members got a letter from a random guy who offered to buy her three-decker house for cash because she lives within two blocks of the Four Corners train station. We worked hard to get those stations built so we could get where we wanted to go at a fair price, not so these vultures can swoop in and trick people out of their homes,” said Bush. Latimore said that Codman Square NDC has begun documenting similar instances of speculators offering cash for homes on the west side of Washington Street – a heavily residential neighborhood close to the new Talbot Avenue stop on the Fairmount Line. The NDC also recently completed a survey of residents who live on the side streets west of Codman Square, she said. The surveys, conducted via door-to-door visits, sampled 100 households (with 75 respondents) and offered some insights into the pressures now being experienced by tenants and homeowners there. Mapping Neighborhood Transformation ReportMela Bush hopes that Sunday’s forum – and others that she says are in the planning stages in other sections along the Fairmount Line – will be used to educate aging homeowners about the risks of selling to speculators and to inform tenants on their rights as well.